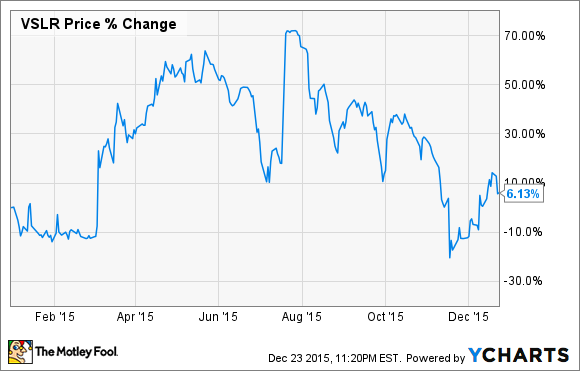 Would Vivint Solar, Inc. have been better off going it alone in 2015? Vivint Solar (NYSE:VSLR) was once one of the biggest winners in the solar industry. The stock was up 70% for a short time after the company agreed to be acquired by SunEdison (NASDAQOTH:SUNEQ) in a deal that would make a global renewable energy giant. But a series of bad moves by management led to the company plunging from that high, with the stock now barely above breakeven for the year. Here's where Vivint Solar went wrong in 2015. The best day Vivint Solar had in 2015 was when it announced it was being acquired by SunEdison for $2.2 billion. You can see in the chart above where that peak happened in July. From there it was all downhill for both renewable energy companies. The first problem came with the structure of the deal. Vivint Solar was supposed to get $16.50 per share, of which $9.89 was cash, $3.31 was SunEdison stock, and $3.30 was SunEdison convertible notes. Getting stock as part of the deal isn't necessarily bad, but it's not as stable as cold, hard cash. I think it would have been wise to have a way out of the deal if SunEdison's stock were to plunge. As far as we know, Vivint Solar didn't have a way out, and when SunEdison stock started to crash Vivint Solar went with it. Things at SunEdison have gotten so bad that it was unlikely the company would be able to complete the acquisition as planned after its stock and the stock of its main yieldco dropped. This meant Vivint Solar had an out if it wanted, but it decided not to take it. On December 9, Vivint Solar announced that instead of holding firm and potentially letting the buyout fall through, it had renegotiated the SunEdison buyout. Shareholders would get $2 per share less in cash and a $0.75 per share increase in stock consideration, although that didn't come close to making up for the lost value of SunEdison's original $3.31 per share in stock. Not only was the buyout poorly constructed in the first place, Vivint Solar was now taking far less money than the original offer because of the fall of SunEdison. We still don't know if the deal will close as planned in early 2016, but it's been a debacle for both companies since it was announced. It could be argued that Vivint Solar bent over backward to get a buyout done because it didn't see a bright future if the investment tax credit for solar wasn't extended. But now that the investment tax credit for solar has been extended the solar industry is going to enter a phase of sustained growth, which Vivint Solar should be able to capitalize on. But under the SunEdison unbrella it's unknown if the company will have the same access to funding and flexibility it would have as a private company. I still think Vivint Solar would be better off on its own rather than going through with the SunEdison buyout. Until the deal closes I still think there's a possibility that happens, but for now investors are stuck looking back on the bad moves made in 2015.